As you can see in the picture below, the Research Master in Business and Management uses a variety of study methods. The changes in the programme correspond to the development of your academic competences and your growing research experience. Through its position within the research institute, the Research Master in Business and Management is embedded in an excellent academic research environment of international standing. Therefore you learn from the best. Only ERIM members with an outstanding performance are allowed to teach on the ERIM Research Master programme. The majority are full professors. Your knowledge is developed through several mechanisms. 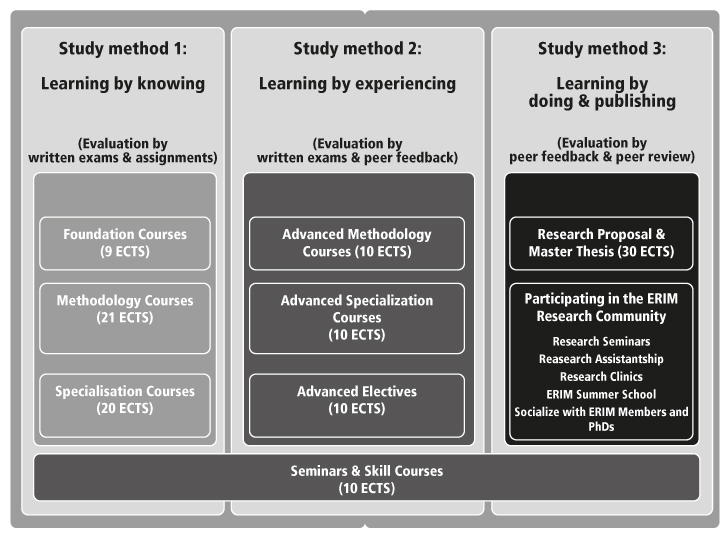 Research activities and interaction between you and ERIM members are stimulated by the formal curriculum and through research assistantship. This enables you to actively participate in research projects with ERIM members, not merely as a typical student assistant but as a true collaborator.